If you have decided on a painted kitchen, but want with slightly more door design detail than the 10RC2, then consider the 10RC3 door. While similar in appearance, this door uses a wider symmetrical cutter shape, which increases the distance between the door frame and the panel raise areas of the door, all while being a solid one-piece MDF door. Note: inside corner of routed detail are not square, they are radiused. 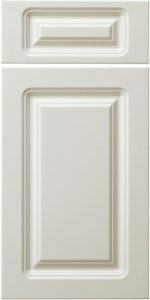 For squared corners, consider the SQ series of MDF doors.